When searching through the game's voice over folder I discovered a set of Benok lines within 202Tel which is the Entertainment Module 081 a location Benok doesn't appear in. meet Benok in the Cantina replacing almost all of his lines for his cutscene. Incompatible with anything that edits "benok.dlg"
Do NOT claim credit for this mod. If you wish to use it please attempt to let me know in advance. 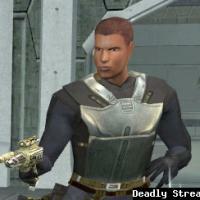 Bioware for such an amazing game, Fred Tetra for Kotor Tool and everyone who downloads the mod.